Home > Getting started > What is SiteRubix? 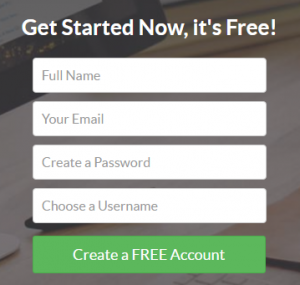 Build free websites now! Hey there! Ready to read my SiteRubix review? Perhaps you’ve come across this post because you have been searching how to start your own business and know that a website is an essential element when it comes to the online business world. Or maybe you’ve already heard of SiteRubix and want to know if it’s safe and whether it can be beneficial for your business or not. Today I will explain what’s SiteRubix about, how it works, the benefits that come with it and more! 2 What is SiteRubix about? 3 What does SiteRubix include? 3.2 What if you go premium? 4 Build a free website now! 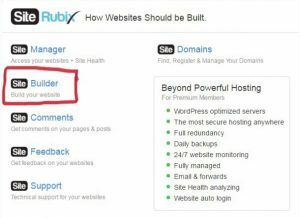 SiteRubix is a website builder platform (included in Wealthy Affiliate) that lets anyone build blogs and websites for free (with a subdomain). Yes, I said it in plural because you can create at least two free websites within this platform. The truth is that there are many places where you can create a free blog, but a lot of them offer a limited amount of tools for a specific amount of time and then you need to pay in order to continue their service, which can be quite frustrating. Here is where SiteRubix comes into play. This is not a mere site builder, since it contains useful and necessary features and tools that will let you manage your blogs in a very easy and effective way, which will make you save a ton of time when it comes to the technical aspects of your business. Now’s the time to see what you get if you decide to use SiteRubix for your blogging career. Yes, I said career because you want at least to make a living from it. Free hosting. This is great if you’re on the starter phase and are on a low budget, since it will save you money. 2 free websites. You can build up to 2 blogs/websites, which is a good deal taking into account that you can get it without spending a coin. 12 templates. You get to choose between 12 different looks for your website. Important details. You get to know about the amount of pages, posts and comments of your website, as well as the site health, which is essential to know if your website needs improvements. What if you go premium? I let you know that everything included in the SiteRubix platform is also included in the Wealthy Affiliate premium membership, so you already receive all the features and tools included in SiteRubix if you go premium at WA. However, in this review I’m gonna focus more on the website and hosting aspect. 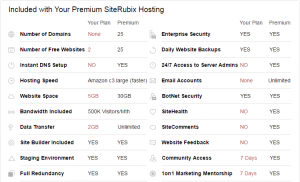 Now let’s take a look at this comparison table between the Siterubix free and premium featrures. “Your plan” means “free plan”. As you can see above, the premium membership has great benefits such as 25 free websites, 25 websites with your own domain, more website space, more help and support, the chance to request comments and feedback, the ability to create “own domains” email accounts, SSL certificates that will give your websites more security, a deeper look into your site health (the free plan also lets you know about your site health but not all details), among others. As I mentioned before, SiteRubix is included at WA, so you can get all this for the same price as the Wealthy Affiliate premium membership ($49 a month or $359 a year). 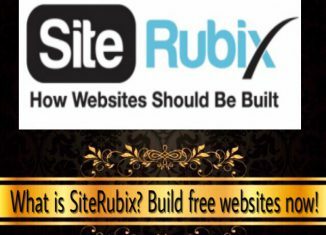 In this section I’ll show you step by step how to build a website with SiteRubix. 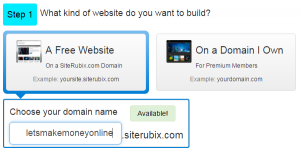 Go to SiteRubix and click SiteBuilder. Once you click SiteBuilder, you’ll get redirected to the website builder platform. Choose “a free website”. 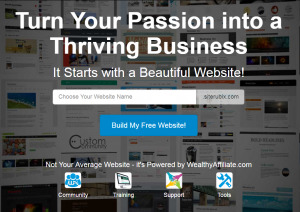 You’re a free member so you’ll choose to build a free website to get started. Choose a domain name. Once you’ve clicked “a free website”, you’ll have to type a domain name you want to see if it’s available. Another thing is, you’ll need to choose a niche before this because your website’s domain should be related to your niche. For example, if I choose the “earn money online” or “internet marketing” niche, a domain name available is “letsmakemoneyonline”. Choose a name for your website. Once you’ve chosen a domain name, it’s time to name your website and this name can be the same as your domain. See what I mean below. Choose a theme. As a free member, you can choose between 12 beautiful themes for your site (there are more than 2,400 for premium members). Click “I’m Ready, Build My Website Now!”. Now that you’ve chosen the domain name, the website name and the theme, it’s time to put it all together and create your website! See it below. In case you’ve already thought of a domain name, you can type it below and you’ll be redirected to the SiteRubix platform to set up your website! As you see, it’s easy and it can take you like 30 seconds to build a website with SiteRubix. No coding or technical skills are required, anyone can do it! I recommend this site builder platform to anyone who’s starting out as a blogger or online entrepreneur, anyone who is serious about making money online and committed to build a successful digital business! In case you’re already a blogger and are searching for a better blogging and hosting platform, there’s also a way you can transfer your domain name to Wealthy Affiliate and access to all the SiteRubix features. Another good thing about building a website with SiteRubix is the fact that you become a Wealthy Affiliate member, and this way you get access to training, tools, support and the community, which will help you along the way. The truth is that anyone who’s achieve success in anything in life was once a beginner and made the decision to work hard and stay committed to get where they’re today. If you’re someone who dreams big and are willing to roll up your sleeves and turn your passion into a business, you’re in the right place! You can create a free account on Wealthy Affiliate (click the image below) and let it guide you, step by step! I hope the information I provided has been helpful to you. If you have any questions or doubts related to SiteRubix or Wealthy Affiliate or have had any kind of experience with another site builder, leave a comment below! I will do my best to help you out 🙂 Thanks for dropping by! Hi, Miren, Siterubix is really the best site builder I have ever used, it’s so easy and fast. I have literally built my website is 15 seconds. Thank you for this thorough review and hope you are having a good day! You have given a detailed review of SiteRubix. I have noticed from your chart that the Free Member does not have 24/7 access to the Server Admin. What does the member do if support is unavailable when he needs it? Based on the information given, I agree with you that the benefits of the Premium Membership are greater than the Free Membership. I have a greater understanding of the SiteRubix platform now, thanks to your review. I found the step by step guide of how to build a website very helpful. Hey Luna, thanks for connecting! I’m glad you found my review helpful ? How do you think having a free site rubix domain compares to having your own .com, .net domain when it comes to ranking on google? I took the premium membership at Wealthy Affiliate and was surprised to make page 1 of google relatively quickly with no paid advertising and hardly any social sharing. Hi Deb, thanks for dropping by! Talking about domains and subdomains, a subdomain is not owned by you so if you have a free SiteRubix website, it is owned by WA. About the ranks, they both may rank the same depending on the keywords but having your own domain looks more authoritative and professional, which I believe that will make your site convert better. Is Social Sale Rep a scam or legit? This review exposes the truth!